As a step towards a greener future, we have incorporated the use vegetable based inks. Vegetable inks can be made from a variety of corn, walnut, coconut, linseed, canola and soy bean oils. 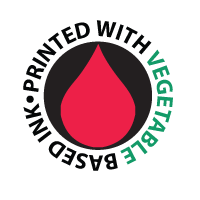 Using vegetable based inks ensures that our boxes will not leak toxic waste into our earth. Another bonus to vegetable based inks is that they produce much brighter and cleaner results!